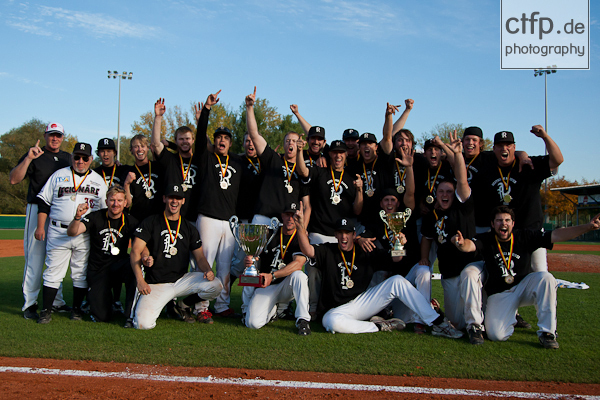 The Buchbinder Legionaere Regensburg have won the German Baseball Championship for the second time in team history after defeating the Heidenheim Heidekoepfe 10-4 in the decisive game five of the final series. 2,381 people attended the match at the Armin-Wolf-Arena in Regensburg on Saturday. Regensburg had won the first two games of the series, but last year’s champion Heidenheim tied the series with victories in games three and four, setting up the dramatic game five. The Heidekoepfe looked like as would they be able to complete the comeback in the series, as they took a 4-0 lead through four innings on Saturday. Robert Gruber reached with a single in the top of the second, stole second, advanced to third on a groundout and scored on a balk by Mike Bolsenbroek. Two frames later an error helped Sam Whitehead and Simon Guehring to cross the plate. Johannes Schaeffler drove in another run with a RBI single. But the four-run advantage was not big enough for the team of manager Mike Hartley. They couldn’t score anymore and the Buchbinder Legionaere came back in the bottom of the sixth. They loaded the bases with no outs. A two-run double by Klaus Hopfensperger put them on the board. RBI singles by Chris Howard and Chris Zirzlmeier tied the contest. Heidenheim avoided further damage, as Regensburg left three men on. However it delayed only the unavoidable. Ludwig Glaser hit a one-out double in the bottom of the seventh and scored the go-ahead run for the Buchbinder Legionaere on a double by Howard. The home team blew things wide open in the eighth. A sac fly by Glaser made it a two-run lead. Final MVP Hopfensperger and Howard followed with back-to-back homeruns for four more runs, sealing the 10-4 victory. Boris Bokaj relieved Bolsenbroek in the sixth and earned the win after retiring twelve of the 15 batters he faced. Martin Dewald got the starting nod for the Heidekoepfe. He struck out five in the first five innings, but lost his rhythm afterwards to take the loss.